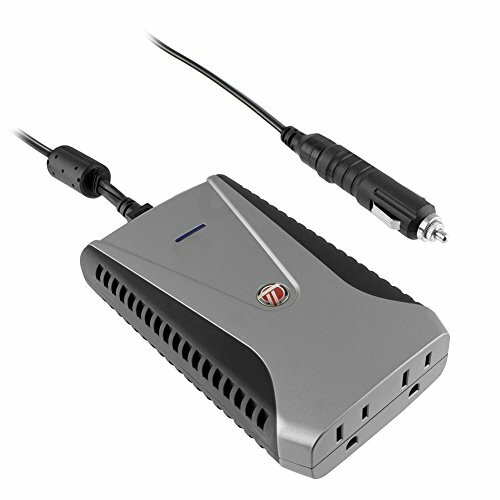 The Targus Slim-Line DC-to-AC Power Inverter is designed for the mobile professional or recreational user, providing the ideal power source while in RVs, cars, airplanes, or boats. The inverter plugs directly into the cigarette lighter or the airplane seat power plug and can power or charge up to 4 devices at once. It features two 120V AC plugs, one USB port, and one Targus PPS port, which is compatible with the Targus Auto/Dual Digital Device Power Adapter (not included). Now, you can easily power a laptop, charge your phone, and more all at the same time. The inverter delivers 150W of continuous power and up to 180W of peak power, and features over-current, over-temperature, and surge protection.